You can use program CrazyPaint to draw lines of different thickness using the mouse, flood-fill, erase, save files and load files. James has written his own Jline procedure to draw lines. New users will be able to create graphics with the program intuitively; standard icons represent the buttons. A click on the save icon executes program saveall using the exec procedure available in the dos unit. James developed his version of a combo box in which you can select from available filenames or type in a new one. Program loadall works similarly. Follow the links at the bottom of this page for further details and the code of these auxiliary programs. The following screenshot shows the program in action. In order to run programs CrazyPaint, saveall and loadall, you will need to have downloaded Stefan Berinde`s wingraph.zip file as described in our Graphics tutorial. You should copy the unzipped wincrt.pas, winmouse,pas and wingraph.pas (from the src folder) into your program folder. (The compiled units are included in the zip file but you might as well have the source code available for reference). You should find these files useful for your own graphics programs. The three programs also need the Icons and savedata folders of files and program CrazyPaint needs saveall.exe and loadall.exe. 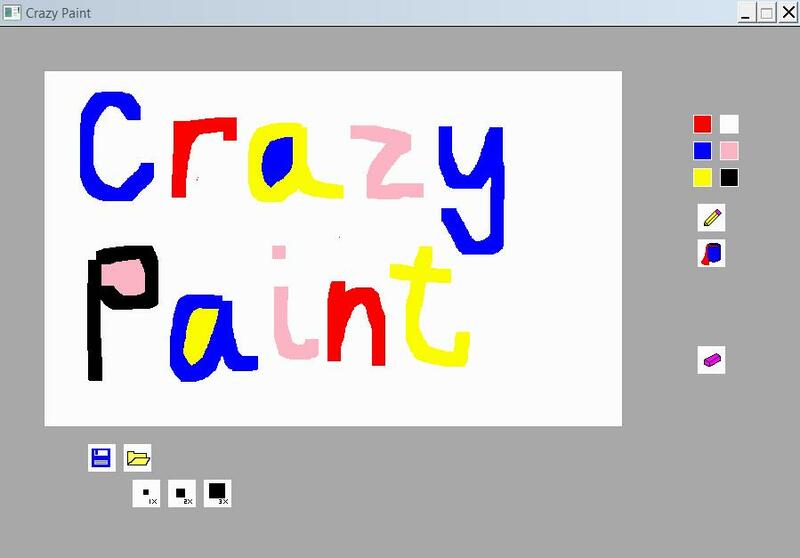 Download the source code for programs CrazyPaint, saveall and loadall together with these folders in crazypaint.zip. We have added comments to these programs. screen[i, j] := 0; //Screen will be used to store actions to be carried out upon mouse clicks. //Confirm that directories are set up and that saveall.exe code has run. //Confirm that directories are set up and that loadall.exe code has run. Could you write your own paint program or extend the range of colours available in this one?